Carlsnaut is an oval-shaped Bakugan Trap that resembles a jet turbine. People were anticipating it to be in New Vestroia, but it wasn't seen. It's head looks like Hylash. Carlsnaut wields sharp, twirling blades and can create energy attributed balls to hit his opponents. 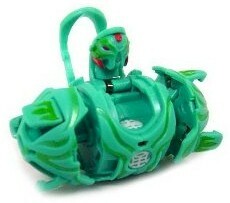 It also changes the attribute of your Bakugan to another attribute that is considered its "opposite". Purchase Season 2 Bakugan Carlsnaut from Amazon now!